Skurge is a powerful Asgardian warrior known for being a villain and generally as the henchman of the Enchantress or Loki. He has often been used as a foe of Thor. Though not a main character his death is often called out as a highlight event amongst Marvel fans. Karl Urban will play Skurge in Thor 3 Ragnarok. It is possible his famous death will be shown as the villain of the film is Hela. Skurge is born in Jotunheim and is half Asgardian and half Frost Giant. He grew up being an outsider to both Frost Giants and the Asgardians. His first major forays as a warrior were against the Storm Giants. Skurge is often shown with the Enchantress. He has real feelings for her but she uses them against him and turns him into a thrall (slave). Enchantress at later points is shown to have real feelings for Skurge as well but she generally does not act on them. Loki has the Enchantress and Skurge attack Thor where they are beaten. Later, the pair are deemed to be troublemakers and are exiled to Midgard by Odin. They then join the original Masters of Evil beneath the leadership of Baron Zemo. The pair help battle the Avengers but are defeated by the super hero team multiple times. 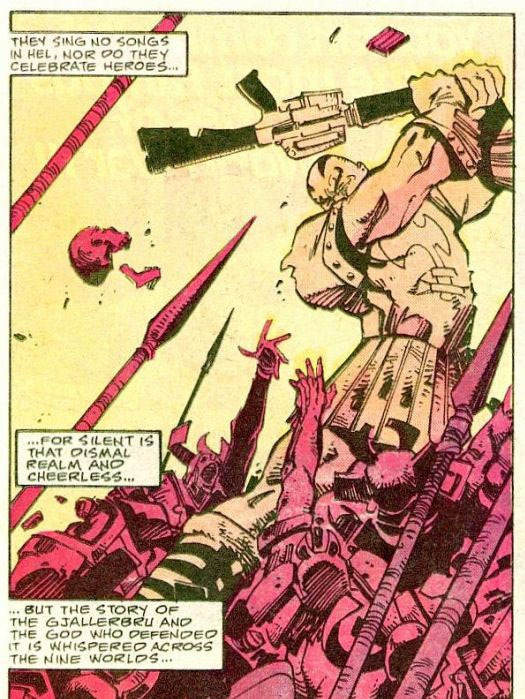 Skurge begins using an army of trolls. First he uses the army to attack Asia in a scheme with the Mandarin. Then he leads the troll army against Asgard itself. In both cases he is defeated. He battles Doctor Strange and the Defenders with the Enchantress and is defeated both times. Enchantress begins a relationship with Heimdall leaving Skurge free of her mental enslavement. Hela also tricks Skurge into believing that Enchantress is dead. When he learns of this trickery he is enraged at being mocked. He joins an expedition to battle the forces of Hel with Thor. During the mission in Hel the group of heroes is being pursued by all of the demonic armies of Hela. The group reaches the bridge of Gjallerbru where Thor swears to defend the bridge until all mortal souls are allowed to pass. Skurge knocks out Thor from behind. He explains to Balder that he wishes to remain behind to exact vengance on Hela for tricking him and for his own redemption. Balder agrees to Skurges plan and leaves with Thor, the Einherjar and the mortal souls. Skurge remains alone on Gjallerbru armed with a variety of M-16 rifles. He battles all manner of demon as they attempt to cross the bridge. While he stood no one was able to cross the bridge. His last stand greatly impresses Hela. 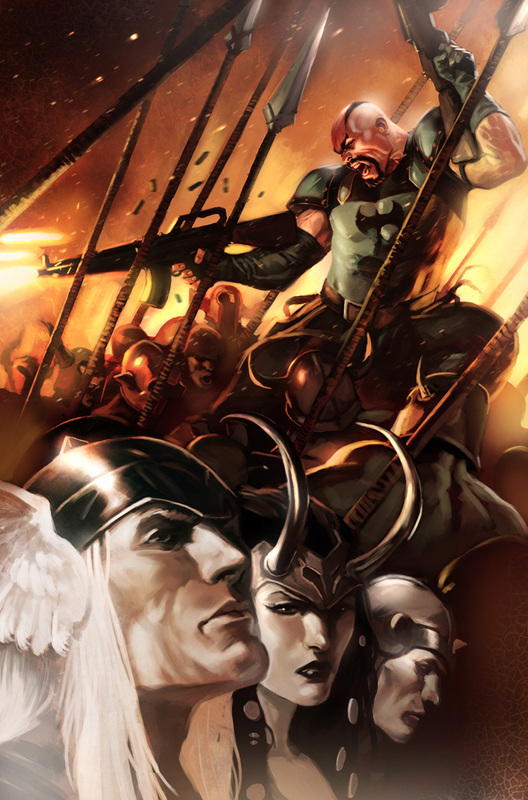 Eventually the armies of Hela overrun him and he is brought to Hel to be one of Hela's consorts. Skurge in Hel does not sit well with Thor and Balder. The pair return and see that he is rightfully released into Valhalla warrior paradise. He asks Thor and Balder to toast his name and both do. The Enchantress attempted to attack Yggdrasil to free the Executioner from Valhalla but was convinced away from this scheme by Balder and Thor. The Enchantress replaces Skurge with a new god named Keep. Stronger than a typical Asgardian due to his Giant heritage. He is also known for having falcon like vision. Blood Axe - Used as a double bladed Axe that could cut through dimensions and control the elments of fire and ice. Horned helmet that was deemed unbreakable and impregnable. Skurge has not yet appeared in the MCU. Karl Urban will play Skurge in Thor 3 Ragnarok. Karl Urban explains how is character ends up as Asgard's gatekeeper and ends up joining forces with the Hela. "My character is operating the Bifrost device and suddenly Cate Blanchett walks through the Bifrost and I very astutely realized I either joined her or die. So my character is a survivalist. The journey of Scourge is really ‘OK, now you made a pact with the devil and it comes with a price.’ That price is constantly upped through the movie and that is his journey."